Seth has been participating in an astronomy conference, RNAA 2008, in Monterrey, Mexico. You can listen to his talk by visiting our Spanish language partner, RadioKosmos, and clicking on the AudioBlog link on the right. Then select RNAA 2008. Seth's talk is being translated into Spanish as he goes along. You can also find Are We Alone? episodes partially translated into Spanish in the audioblog. View photos of the event, including some of Seth, by visiting www.astronomos.org and clicking on "fotos de la XIX Reunion de Aficionados a la Astronomia..."
Thanks to Lourdes Cahuich for all her work with our show and Seth's visit! Hey, baby, got a light? Yes, even babies were fair game in the cigarette advertisments of the 1950s. Oh, and this man isn't really a doctor. But - hey - anything goes when it comes to peddling tobacco. 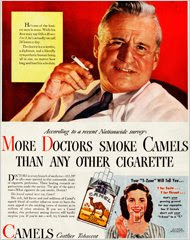 Find out how cigarette companies manipulated images and twisted the truth to get Americans to light up. It's "Skeptical Sunday: I'll Buy That!" See more images in the exhibit, "Not a Cough in a Carload: Images Used by Tobacco Companies to Hide the Hazards of Smoking"
Kinoki Pads: Withdrawing Toxins or Just Your Money? Our Hollywood Skeptic turns guinea pig as he tests the claims of body-purifying Kinoki pads. "No amount of Kinoki pads would have a chance cleaning out the Super-Fund site inside my body." Find out if he's right: "Skeptical Sunday: I'll Buy That!"